It wasn’t until I was well away from the schooling years did I get to eat at Café by the Ruins. (Ohhh, like Forest House, I’m pulling my hair out. I waited so long =D You really have to set your mind to eat in a unique place like this and also, you had to prepare yourself for the experience.) For years, I was teased by this café’s tall close-knit bamboo fencing (not even giving a small peek into its surroundings *making pouty faces =b). When a friend from another country came to Baguio for the first time, Café by the Ruins was one of the places we went to. This time, for snacks – something to chew on *harhar, it was a good experience for me and my friend. (Shout out to Paul! (“,)) Of course, we had their bread and spread (go, kamote bread! =D), crème brulee, tea and coffee. It’s breakfast at the Ruins with Race, next visit. The café French toast was my choice and this came with a fruit cup, coffee or tea. Race woke his stomach up with a bowl of champorado. This was served with a saucer of fried boneless dilis (which looked more like daing, so I don’t know the difference anymore =b). Interesting though, I never knew this to be a good combination. It tasted fine, wonder of wonders, alternating with the champorado. *shocked look dissolving from my face. The homecoming spread \m/ More bread, more spread, more, more of everything!!! 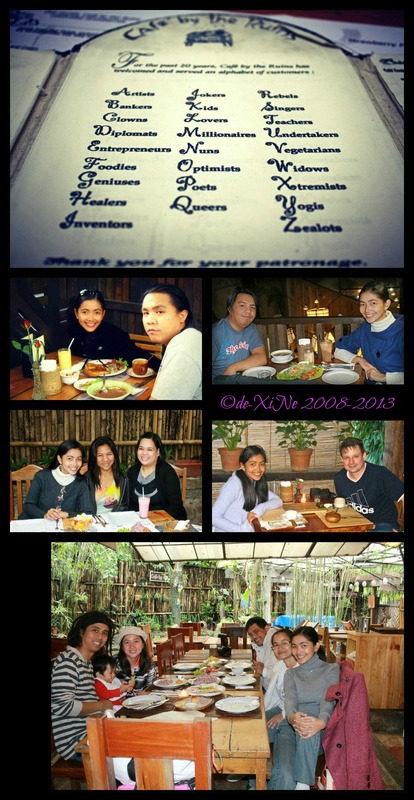 X marks Café by the Ruins for good food in Baguio. Here’s to more years of good food and great dining experiences! Good morning, hello! Thank you so much! (“,) Kain na! Have a wonderful Sunday!